No one seems to notice Sam Mizrahi as he stands in the middle of the intersection of Bloor and Yonge streets, posing for the camera during the scramble crosswalk on a misty autumn afternoon. It’s ironic that nobody pays any mind to the 43-year-old developer, because, in a few years, it’s going to be impossible to miss what he’s done. Back in October, the president of Mizrahi Developments acquired a number of contiguous properties on the corner of Yonge and Bloor, including long-standing Toronto menswear retailer Stollery’s, for over $200 million. The plan for the site is to build a luxury condominium high-rise — a standard practice for developers in this condo-rich, modern T.O. But Mizrahi’s vision is anything but standard, and it would certainly have to be when you consider the address that comes with it. 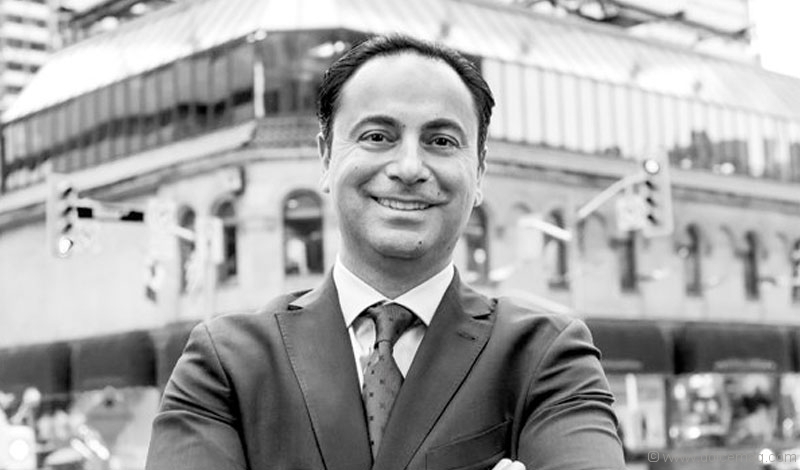 “One Bloor Street West, it doesn’t get any better than that,” says Sam Mizrahi from his company’s office on Hazelton Avenue. 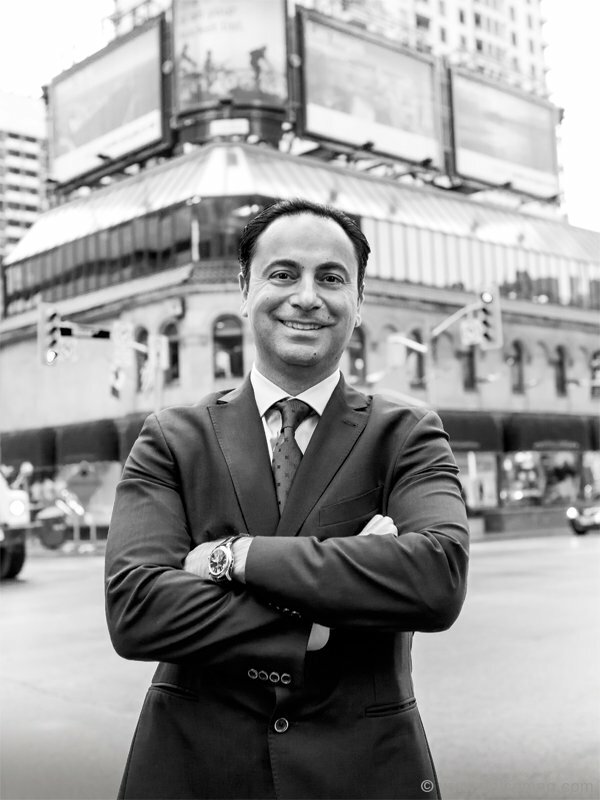 For Mizrahi, the Yonge-Bloor intersection is the most important real estate corner in the city — if not the country — and he has good reason to believe so. Over 51,000 pedestrians cross those streets every day, making it not only the busiest corner of the Mink Mile, the heart of upscale shopping in Toronto, but one of the busiest in the city. Mizrahi fully appreciates its significance. The building he envisions is both “epic and iconic,” a landmark on par with renowned structures of other world cities. “We wanted this to be the Rockefeller Center or the Chrysler Building or the Empire State Building for Toronto. And this is the corner to do it in,” he explains. The project will be the first billion-dollar residential/commercial building in the country and he’s already dubbed the new development “The One” to match both the address and his grand vision. While the project is still in the initial planning stage, Mizrahi explains that The One will feature amenities such as a rooftop terrace, underground parking for residents and the public, doormen and valet service, gardens, pools, restaurants and be connected to the underground PATH network for easy access to the subway. It’s too early to say what its height will be, and he won’t get into the specifics, but Mizrahi notes that The One will be comparable in scale and context to surrounding developments. Great Gulf Homes’ One Bloor East climbs skyward right across the street and will peak at 75 storeys. One wonders if Mizrahi will dare to go higher. Being a cornerstone of the Mink Mile, retail will also be a crucial component of the building’s street presence. Mizrahi explains that retail space is being custom designed with no columns or pillars obstructing the line of sight to house flagship stores from top international brands. He can’t say which retailers he’s in talks with, only that they’re “the ones” in their respective sectors. Mizrahi certainly isn’t the first developer to propose a project with these types of lofty ambitions. For the past several years, Toronto has been the leader of under-construction high-rise projects in North America, and there are many aiming to make their mark. Canderel Residential’s Aura skyscraper on the corner of Yonge and Gerrard is currently Canada’s tallest residential tower at 78 storeys. David Mirvish has gone back and forth with the city since 2012 about the colossal Frank Gehry-designed towers he wants to erect on King Street West. When One Bloor East is finished, the wavy, ultramodern, mixed-used high-rise will be Toronto’s second tallest residential tower. The contemporary glass-and-steel template for high-rises has become the norm for virtually every developer in the city. While eye-catching, that type of design also carries risk: they may be trendy and fashionable, but fashion becomes dated, goes out of style, and trends fade. Mizrahi isn’t in the fashion game. He wants timeless. This mindset was a cornerstone of his last two boutique developments, 133 Hazelton and 181 Davenport, and one that won over Stollery’s co-owner Edwin Whaley. Whaley explains he’s had offers to buy Stollery’s prestigious address since 1968, but in the past five years interest has intensified. Nearly every day he was getting calls from over 30 developers from around the world trying to convince him to sell. Near the end of 2013, Mizrahi approached Whaley to do the same. The two found an instant chemistry and over the next 10 months built a rapport that became the foundation of the sale. Perhaps one of the most interesting aspects of the project is the choice of architect. Mizrahi has brought in Norman Foster of Foster + Partners, who will be collaborating with CORE Architects here in Toronto. Foster is one of the world’s leading and most famous architects as well as a Pritzker Prize winner, so his talent is undeniable. But he’s also known as a practitioner of high-tech architecture and his oeuvre is filled with sleek, highly modern work, such as 30 St. Mary Axe in London, England, the Hearst Tower in New York City and the London City Hall. Much of his work is far more future-forward than the classic style of Mizrahi’s previous developments, so it will be interesting to see what Foster brings to the table in terms of design. And as work begins on The One in the coming months and years, that’s something that will be impossible to miss.